Number 3 at The Old Stables in Knitsley, near Consett sleeps 4 people. The Old Stables in Knitsley are located in the tiny hamlet of Knitsley, just south of Consett and in the heart of County Durham, The Old Stables, adjacent to the owners’ home, are tucked away in the most beautiful of locations. Private, peaceful and semi rural yet still easily accessible to major road networks, these terraced holiday properties (refs 30710 [Number 1], 30711 [Number 2] and 30712) offer guests quality finishes yet still remain cosy, comfortable and welcoming. 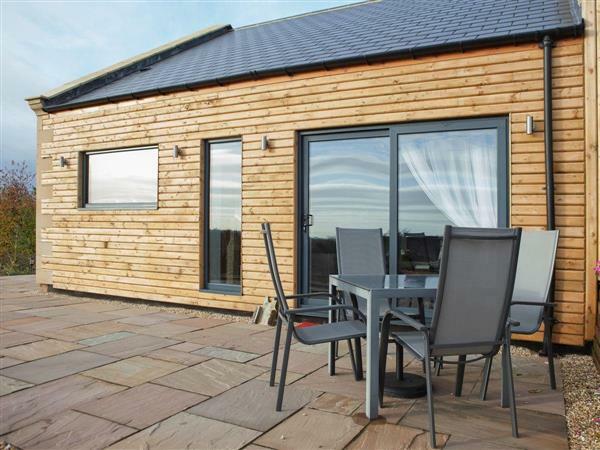 Each property is unique and desirable and all share the added feature of a hot tub that offers guests views across some of the most beautiful countryside that County Durham has to offer. Situated in the owner’s grounds, guests will find the properties private and extremely well-maintained and presented. On arrival, guests will find a welcome pack consisting of local produce from the nearby Knitsley Mill Farm Shop. All on one level and perfect for guests of all ages, friends, families and couples will be able to book one property that sleeps four or all three properties can be booked together for larger groups and extended families. With so many attractions and plenty to explore, see and do in the area, The Old Stables can cater for every need. There is even the opportunity for guests to bring their horse along too with prior arrangement with the owner, as there is a paddock and stables on site. Perfect for walkers, ramblers and cyclists of all levels, guests will find that there are many established public footpaths, cycle paths and bridle ways that lead from Knitsley and in to the heart of County Durham and through the Durham Dales, where the scenery can only be described as breath-taking. The Old Stables are also perfect for guests wanting to visit the cathedral city of Durham, which is only 10 miles away. Durham offers plenty to see and do including the Gala Theatre, Freemans Quay Leisure Centre and many historic attractions, including Durham Castle, Durham Cathedral and the city walls. The River Wear runs through the city and guests can enjoy a romantic boat trip or relax by the riverside. Filled with top quality restaurants, bistros, cafés and bars, the city is thriving at night and is there is often street entertainment to enjoy, including the Lumiere Festival, jazz festival, book week, arts week and many more. The thriving city of Newcastle is less than 20 miles away and perfect for a great night out. The banks of the River Tyne are bustling with bars, restaurants and bistros, and there is definitely something for all tastes. A little further afield, but still within an easy drive from The Old Stables, guests will be able to visit and enjoy Barnard Castle, Raby Castle, Bowes Museum, High Force and Low Force waterfalls. The excellent visitor attraction of Beamish is another must see and once again, is only 10 miles away. Each property offers a well-furnished living room with great views across the surrounding grounds, a well-equipped kitchen, two double bedrooms with Egyptian cotton bed linen. The shop and pub serving food are ½ mile from The Old Stables in Knitsley. The Old Stables in Knitsley are all on ground floor: Living room with French doors and wooden floor. Kitchen with wooden floor. 2 bedrooms: 1 double (5ft), 1 twin. Bathroom with shower over bath and toilet. All properties: Gas central heating, gas, electricity, bed linen and towels included. Travel cot and high chair on request. 42 Smart TV. Gas hob. Electric oven. Microwave. Washing machine. Dishwasher. Wi-Fi. Small, enclosed patio with sitting-out area and furniture. Shared grounds. Parking (2 cars). Shared hot tub. Stabling and paddock available on request. Welcome pack. Pet free of charge. No smoking. Holidays at Number 3 at The Old Stables in Knitsley run from Friday to Friday. Pets allowed at The Old Stables - Number 3. For a better idea of where The Old Stables - Number 3 is, you can see The Old Stables - Number 3 on the map below. The Old Stables - Number 3 is in Durham; should you be on the lookout for a special offer, you can find all the special offers in Durham. It's always worth checking to see what is on offer at the moment. Do you want to holiday near The Old Stables - Number 3 (30712), you can see other cottages within 25 miles of The Old Stables - Number 3; have a look to find your perfect holiday location.